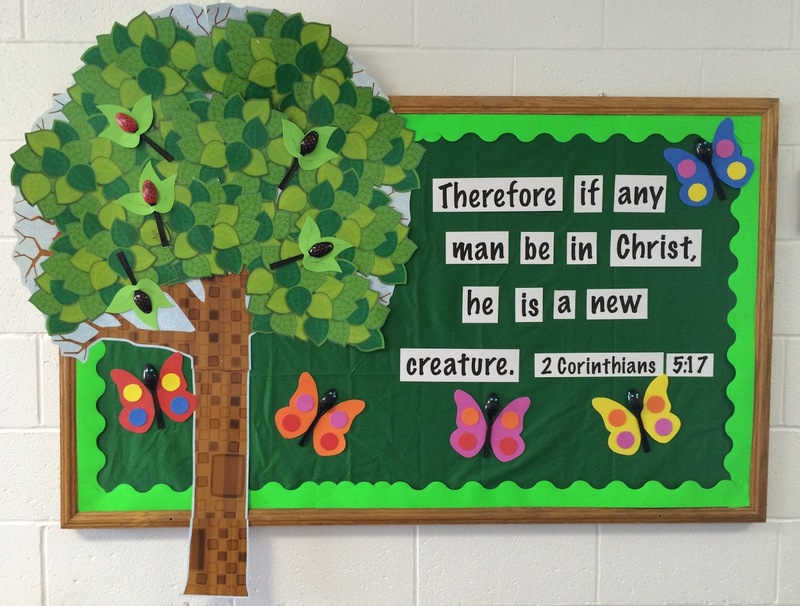 This is the end-of-summer bulletin board I put up at the church this week. I adore the bright colors, and I pray everyone who sees it is blessed by the truth of the Scripture on it. I decorated my favorite tree with ladybugs and butterflies, each made from a plastic spoon and craft foam plus some gem stones and a little bit of paint. Click here for the tutorial on making the lady bugs. As much as I love the lady bugs, I think the butterflies are my favorite of the two. You can do just about anything you want to decorate them, and they're super easy to put together. I found a butterfly template online that I liked and printed it out on card stock. I sized it so one wing would fit on my small sheets of craft foam. I traced around each wing and carefully cut just inside the line so it wouldn't show. The two wings are connected with tape right behind where the spoon will cover the seam. Then came the fun part - I punched circles to add to the wings and used tiny blue gems for the eyes. To put it all together I taped the spoon to the wings with tape, keeping it carefully hidden so you can't see the tape from the front. And here's the finished product! They're very light, so all I needed was double-stick tape to adhere it to the fabric of my bulletin board.